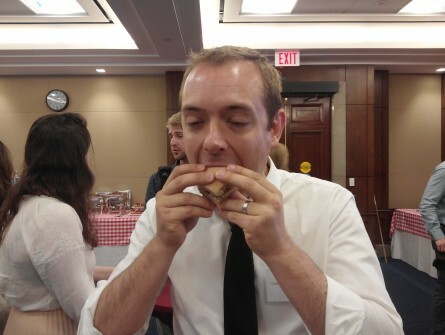 Dietary allegiances were tested on Capitol Hill Wednesday, as the meat lobby and vegetarian-friendly toque Todd Gray squared off in a culinary tug of war for control of the hearts and minds — and mouths — of the legislative branch. 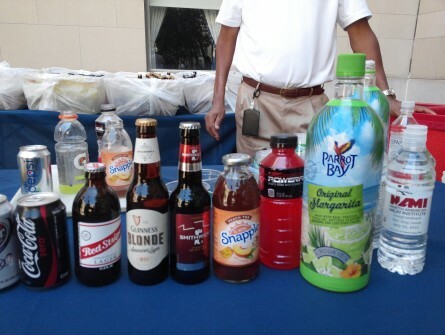 The North American Meat Institute and Physicians Committee for Responsible Medicine arranged for the widely attended free lunches, with each group courting its specific constituency with custom touches. Meat and Greet In addition to fielding a cornucopia of pork products (we spotted at least two different cheese-spiked bratwursts, a handful of Italian-style sausages, a kielbasa and plenty of traditional wieners), the annual hot dog lunch was serving up some noteworthy extras. 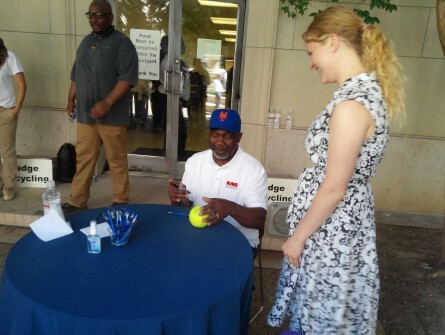 The other was a trio of baseball legends: New York Mets vet Mookie Wilson, Boston Red Sox alumnus Bill Buckner and Baseball Hall of Famer Tony Pérez. 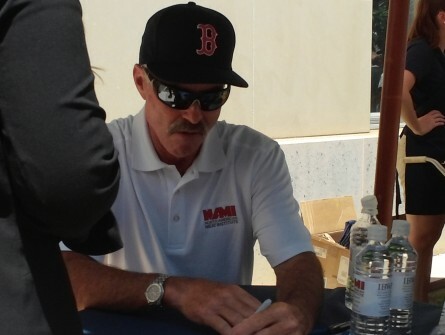 “I like that there’s just some random guy in a Strasburg shirt,” a seemingly oblivious female staffer told friends while watching the baseball fan jockey in line for an audience with Buckner, whose career will forever be linked with Wilson&apos;s after a Wilson dribbler went between Buckner&apos;s legs in Game 6 of the 1986 World Series, throwing momentum to the eventual champion New York Metropolitans. Lawmakers sure seemed to get it. Rep. Robert W. Goodlatte, R-Va., a die-hard Red Sox fan, waited his turn just like everyone else to get a pair of balls signed by Wilson. Across the courtyard, Ohio Republicans Bob Gibbs and Brad Wenstrup chewed the fat about Pérez’s glory days as part of Cincinnati&apos;s Big Red Machine. 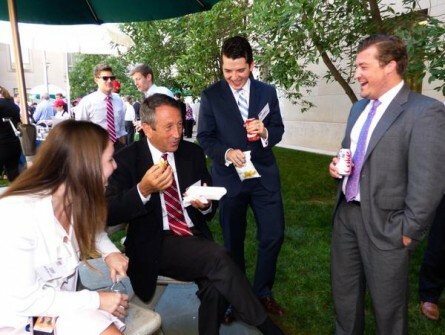 In the end, many members (we spotted Reps. Mark Sanford, R-S.C.; Joe L. Barton, R-Texas; Doug Collins, R-Ga.; and John Shimkus, R-Ill., availing themselves of the carnival-like atmosphere) and staff wandered off fat and happy, their bellies full of smoked meats and frosty brews. 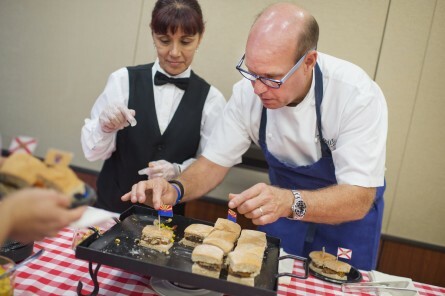 A Growing Revolution Down the hall, Equinox founder and chef Gray worked diligently to put the finishing touches on a signature vegetarian burger topped with a quartet of congressionally inspired condiments. Gray introduced a vegan tasting menu at his flagship restaurant in 2004 and subsequently shored up his power base among green diners in 2011 by launching a vegan brunch at the Corcoran. Earlier this year, he challenged himself to produce a worthy counterpart to the Obama burger fielded by Capitol Hill dining impresario Spike Mendelsohn, and the outcome was the meat-free FLOTUS burger. Gray’s alterna-patty is forged from shiitake mushrooms, mashed black beans, cooked quinoa and a host of all natural flavor enhancers. 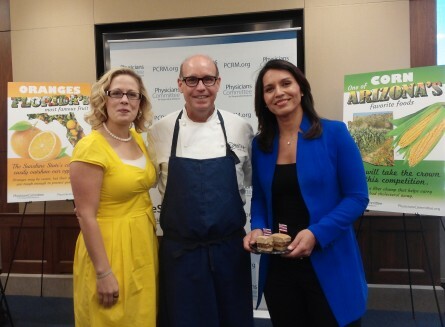 He spruced up the base material to woo the Hill crowd, crowning the signature patty with four distinct sauces in honor of green lawmakers Ted Deutch, D-Fla. (shredded carrot-orange jam); Kyrsten Sinema, D-Ariz. (roasted corn-sweet pepper salsa); Tulsi Gabbard, D-Hawaii (peppered pineapple); and Cory Booker, D-N.J. (tomato chutney). The citrus- and vinegar-soaked carrot jam struck the perfect balance between sweet and sour. The chutney was excellent, complementing the savory bean burger with garlicky, basil-spiked chopped tomatoes. The spicy-sweet pineapple added a sugary blast to every bite. The roasted corn, on the other hand, fell rather flat and seemed rather tame compared to the other toppings. Gabbard, who co-sponsors the Congressional Vegetarian Staff Association, was thrilled by the enthusiastic turnout. She cheered on the Hawaiian-style offering, but promised to give the other states their day in court. “I got a to-go box to sample the others,” she told HOH of her intention to taste the gamut of burger toppings. Fixins aside, Gabbard said she’s cool with bean- and soy-based burgers — so long as they’ve done their homework. “Some of them can be too chewy or too dry, so if you get the right consistency with good flavor then you’ve got a great burger,” she said. When the final tallies rolled in, the Hawaiian burger came in a close second, edged out of the top slot (Congrats, Garden Staters!) by a single vote. 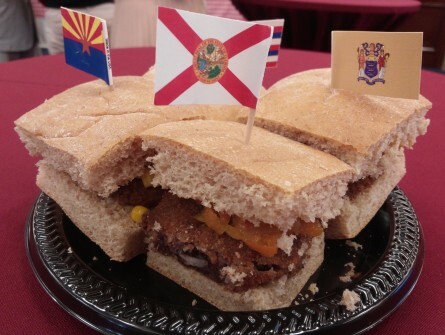 The Florida burger ranked third, while the Arizona burger pulled up the rear. But they were all winners to Gray, who is now dead set on not only returning the FLOTUS burger into the rotation at Equinox — “I’m gonna bring it back for the lunch menu,” he shared — he’s planning to tack on the four sauces so D.C. diners can experience Wednesday&apos;s inaugural Veggie Burger Smackdown for themselves. Meanwhile, Veggie Caucus founder Adam Sarvana is gearing up to make his case to incoming House dining services contractor Sodexho for more green cuisine. The alimentary activist intends to get the conversation flowing by requesting that one hot vegetarian-friendly entrée be served per day in each building. “If it has to start in Longworth, then we’ll go from there,” he said.